*This is a genuine Venetian boardwalk!. Your destination for the Grand Canal is Piazzale Roma. Mestre is on the mainland. To Piazzale Roma, adjacent to the Grand Canal: Use the ACTV line 5 or line 35 ATVO VENEZIA EXPRESS service. To Mestre Railway Station on the mainland: ACTV line 15 or line 25 ATVO MESTRE EXPRESS service. City Centre: ACTV line 45. On FSBusitalia line buses [with an additional charge]. For prices of Bus tickets, including luggage, refer to the ATVO website. There is always another ferry about to arrive! I have spent a number of months in Venezia and just love the sight, sounds and 'feel' of the ferry ... for me it IS Venezia!! That said, prices for single trips can be hugely expensive. Prices on my trip in 2015 were €7,50 for a standard Adult one-way ticket. This is good for 75 minutes after validation, excluding return trips. Special tickets/Travel cards are available, see the table below. This is the stored value card for 'frequent users' of travel services in Venezia. This card replaces the imob.venezia card. 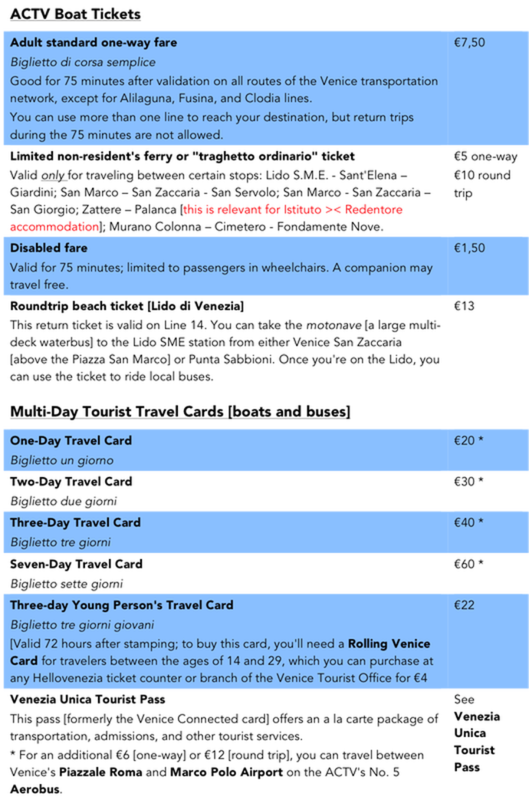 Although it's intended primarily for residents of the Venice region, as a non-resident, you'll pay €50 for the 'frequent users' version of Venezia Unica, but your card will be valid for five years, and you'll be able to add stored-value fares to the card whenever you're in Venice. Technically, the card itself is free, but there's an 'ACTV activation fee' of €40 for the waterbus or 'navigation' network and €10 to use land buses and trams, or €50 overall. By purchasing individual paperless waterbus 'tickets' at the resident fare of €1,50, or even less if you buy 10 rides at a time. You can recharge your Venezia Unica card online. By purchasing a monthly or annual commuter pass, which offers even bigger savings to students and other visitors who use the vaporetti and motoscafi daily. 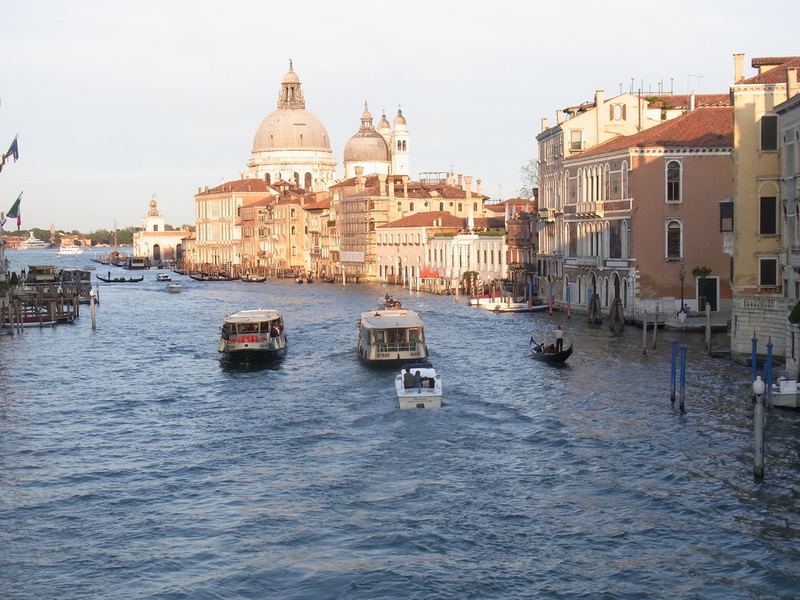 You can use the Venezia Unica card for public transportation on ACTV water buses [vaporetti] and the People Mover elevated tramway [which connects the Piazzale Roma with the Marittima cruise terminals and the Tronchetto parking island]. Venezia Unica will also offer other services [either in packages or a la carte], such as admission to churches and city-owned museums, municipal parking, and public toilets. For the latest information on availability and prices, see the official Website..
You can apply for a Venezia Unica card at larger Hellovenezia ticket offices and licensed agents. We suggest using the main Hellovenezia / ACTV office at the Piazzale Roma, where you'll find a ticket counter inside the building. Below are step-by-step instructions for buying the Venezia Unica card at the main Hellovenezia office [a.k.a. the ACTV ticket office] in Venice's Piazzale Roma. NOTE: Don't confuse this "frequent users" card with the "tourist" version of Venezia Unica, which is a different product that's geared more to museum and church visits. You can have your imob.venezia card enabled as a "Venezia Unica" card by signing a contract at any licenced Hellovenezia office or ticket point. €40 in cash, or a credit card such as Visa or MasterCard. Go inside the building to the Hellovenezia office, which you can enter from the street or via the ramp on the right side of the photo above. Inside the Hellovenezia office, you'll see a machine that dispenses numbered tickets. Press the button for a ticket with a letter and a number. Take the ticket from the receptacle on the bottom of the machine and wait until your number appears on one of the electronic signs above the ticket windows. When you see your number on a sign, go to that window. At the ACTV Cartavenezia window, you'll be given a form in Italian to fill out. You'll also need to give the materials from step 1 [passport and payment] to the clerk. Sign and date the form on the two "firma obbligatoria" lines in the bottom half of the page, then hand the completed form to the clerk. The clerk will accept your completed application form, take your photo or copy your passport's photo with a computer camera, enter your data into a computer, and, within a minute or two, give you an Venezia Unica "smart card" with your photo, name, card number, and the card's expiration date on the front. Turn the heavy plastic card over, and you'll see that a microchip is embedded in the back. This chip contains your Venezia Unica account information and any stored value that you add to the card [such as prepaid electronic "tickets" or a monthly pass]. If you wish, you can recharge your card with tickets [biglietti] or a pass [abbonamento] immediately at the office where you bought your card. Alternatively, you can buy tickets and passes at other ACTV ticket booths and machines, Hellovenezia offices,or authorized dealers such as tabaccherie [tobacconists], l'edicole [newsstands] and bars. You can even recharge your card online. To use the Venezia Unica stored-value card, hold it within 6 cm (about 2½ inches) of the grey-and-white electronic card reader at any waterbus stop. When you hear a beep and the reader displays the message "Buon Viaggio," you're ready to travel. To check how many rides are left on your card, press the "?" key, hold your card next to the machine's sensor within three seconds, and wait for the machine to flash yellow. The machine's electronic display will show the number of fares and their expiration dates. If you plan on a long-term stay, or will be returning regularly, the photo-id type of card works well. They will take the photo and imprint it on the card. Naturally there is a cost for this but it works out well in the longer term. I still have my three-year old iMob card, with flattering picture! 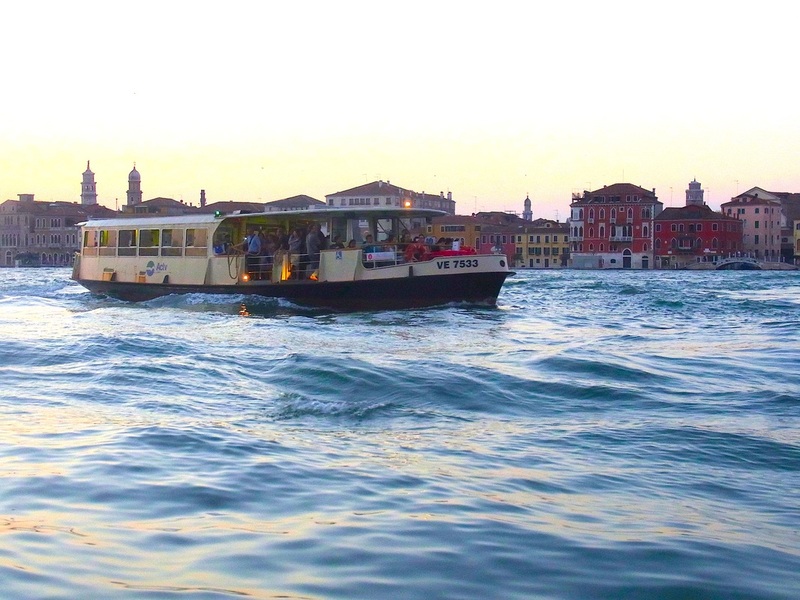 For Istituto Venezia students staying at Redentore it is worth noting that there are also a special low-cost tickets available between Zattere and Palanca, on Giudecca island. This means a short walk to/from Redentore to Palanca but there are savings even on the price of the normal iMob/Unica fare. 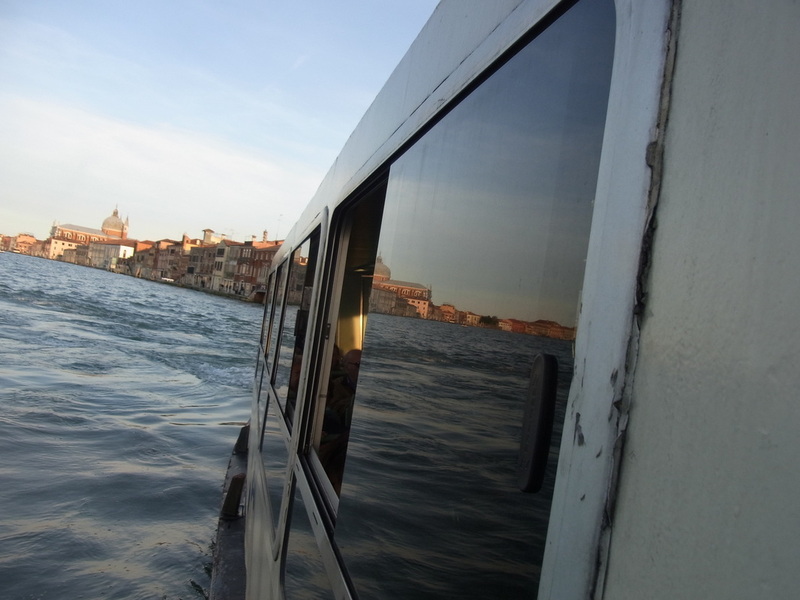 Santa Lucia Ferrovia is your destination for the Grand Canal. Tickets must always be validated before your journey. There are date/time stamping machines on the platforms and it is up to you to make sure they are properly stamped by inserting them and getting the imprint. I saw an entire family of 6, notwithstanding the babe in arms and their protestations, removed from the train for not validating their tickets. Their excuse was that they had to run for the about-to-depart train ... it didn't wash! Off at the next stop! I don't think a fine was applied [though it could legitimately have been] or whether the tickets were confiscated or not, but that would be an uncomfortable situation to be in. The information below is as provided in the Frecciarossa website --- I suggest you check the website [see above] to verify any special requirements you may have. "Trains cross the Italian peninsula reaching the speed of +300 km/h, entering in the heart of big cities crossed by the Italian High Speed line, shortening distances. Choosing a Frecciarossa train means relying on frequent connections, scheduled timetables easy to remember, departure from/arrival directly to the city centre, territorial coverage of large cities, with the possibility of choosing the most convenient station. Frecciarossa trains offer 4 levels of service: Executive, Business, Premium and Standard." I have regularly travelled across Italy on these high speed trains - I just love it! !